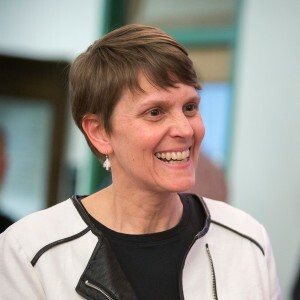 Christine Smart, professor of Plant Pathology and Plant-Microbe Biology, has been named interim director of the School of Integrative Plant Science (SIPS), effective July 1. She will take over for Alan Collmer, the Andrew J. and Grace B. Nichols Professor in the SIPS Section of Plant Pathology and Plant-Microbe Biology when his two-year appointment as the school’s inaugural director concludes. Launched in June 2014 to enhance the visibility and impact of the plant sciences at Cornell, the school integrated the departments of Horticulture, Plant Biology, Plant Breeding and Genetics, Plant Pathology and Plant-Microbe Biology and Soil and Crop Sciences into a single administrative unit within the College of Agriculture and Life Sciences (CALS). The college will conduct an open search for a new director. Smart has broad professional experience encompassing research on fungal and bacterial plant pathogens, extension work in vegetable pathology, and outreach to K-12 students. At her lab at the New York State Agricultural Experiment Station in Geneva, NY, she explores ways to improve vegetable disease management while promoting sustainable agricultural practices. Most recently, she has served as head of the SIPS Council of Extension Leaders and initiated the “Skills for Public Engagement” class for undergraduate and graduate students.